Has it really been three months since my last post? What's been going on? Well, I'm happy to report that Rose and the rabbits are very peacefully coexisting. All parties seem to be quite used to and even comfortable around each other. Much co-lounging, co-snoozing, and happy bunny romping (unimpeded by the dog police) has occured. Here is a picture from about two weeks ago of Mouse and Rose. This is completely unposed - they chose to relax next to each other like this. Looking back, you can see that we've come a loooong way in 5 months! Rose's painful hip dysplasia has continued to hamper her mobility. We are hoping to replace her worst hip, but in the meantime, she goes to swim therapy every 10 days, which really helps her to feel better. Thank you Andrea Z. for your good advice! 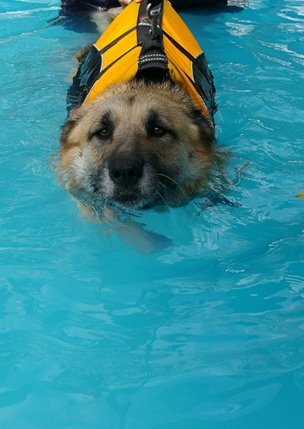 Here's a picture of Rose hard at work in the pool. First of all, be patient. Be willing to move through the process slowly. Remember that you are dealing with a sturdy predator and a delicate prey animal. You can introduce the animals to each other via smells (brushed fur, litter box, bedding, etc.) long before they ever meet face to face. This will help take some of the surprise out of the face to face meeting. I can't stress this enough: set your dog up to succeed. Start out on a positive note with your dog and reinforce her good behavior! Use praise and treats and reward her whenever she meets your expectations. Try to make each interaction a positive experience for both animals. Don't make the bunnies a source of frustration for the dog and don't make the dog a source of fear for the bunnies. Train your dog well. Use cues that your dog can understand to reinforce his "lower" position in the pack: feed the bunnies first, put her (on leash) in a down-stay while the bunnies have free roam, greet the bunnies in the morning before you greet the dog, etc. Make sure your dog has a "Ph.d" in Sit, Stay, Down, Down-stay. I also use the word Gentle to indicate "relax, calm down, no sudden moves". Never let your dog chase or bully your rabbits. Don't let your dog bark at your rabbits. This is unacceptable behavior. I strongly discourage you from making your first move waltzing a dog into your home to "show" your bunnies. Holy terrifying startlement for the bunnies, batman! Holy over-excitement for the dog, Robin! This is called setting up for chaos. Please don't do this. I wish you success in bonding your dog to your bunnies and creating a happy multi-species household. We know now that it certainly can be done! Rose still gets overly excited when the bunnies run around. She wants to either chase or follow them wherever they are running to. I tell her "No" and have her sit back down again (usually she is leaping up from her bed). I would recommend that you really bond with and train your Bella to follow your lead/commands. When Bella is really well trained, with you in the lead, you can put her in a down-stay (on leash) and let the bunnies roam around. It will be a test of her training to resist the desire to chase them or call out. Don't hurry the whole process. Since Bella is still somewhat new to you, you'll want to give her time to adjust to ther new surroundings/people/small furry creatures in the household. And, of course don't leave them unsupervised together. I would talk with other beagle people about the barking. I'm lucky in that Rose is a total non-barker. I've heard that beagles are pretty talkative by nature, but maybe other beagle people have some ideas on how to discourage her from barking at the bunnies. I doubt a muzzle would have much positive benefit in that situation. It would probably just make Bella associate the rabbits with the dreaded device. If you plan on using a muzzle for other situations, you can get her used to it apart from the bunnies and then, once she is comfortable with it, use it in that situation too. Don't despair because Bella is a hunting breed. I have heard of other successful rabbit-dog bondings with labs, goldens, and dachshunds. I think it's a good sign that Bella is calm when she sniffs the bunnies through the cage. Good luck! Thank you so much for your advice. I will work with Bella as you suggested. Hopefully by the summer they will be able to roam free together. I will keep you posted in the progress. Thank you again for this website. My kids are very excited that their bunnies and their dog may be able to become friends. Hi there, I was doing some searches online. I have the same situation with Nora right now. We have learnt of beagle pup in a humane shelter that has not been adopted for a full year now and the person who referred us to his case said that the pup may be put down soon because he has not been adopted. However, I am so fearful and so wary about having a dog in the same house with my lop Cadbury and my lionhead Darwin. We are animal lovers and we just can't imagine the thought of having a wonderful puppy being put down. Your story really provides some hope that this is certainly possible. If you have any other tips, I'd sure love to hear them! My roommate has a rabbit named Star. I recently brought my 8th month old Puggle to live with us. I can train and keep the puggle from going after Star, but how can we make Star okay with the new dog? It's only been a couple of days but Star freaked out at just the sight of the new dog. We couldn't calm her down for an hour. I love my dog, I like my roommate- I'm afraid that even if I keep puggle from paying attention to the rabbit, Star will go into shock at the sight of him. How do we make the rabbit comfortable with the dog? The best thing to do is to have realistic expectations about the time it will take for the bunny and the dog to get used to each other. I took over a month to trust my dog with my rabbits (supervised) in the same room with each other. It is going to take lots of positive interactions (between the two animals), lots of patience (on the part of the humans involved) and lots of time. It's a slow process. If you try to force it you are asking for a disaster to occur. It is no surprise that any rabbit freaks out when first meeting any dog. I really recommend that people introduce the scent of a dog first (via fur or a dog blanket or dog bed) in an environment that is safe for the bunny. Once the bunny is familiar with the scent of a dog, I recommend that you gate off a room of your house and keep the dog on one side and the bunny on the other. That way they can see each other but the bunny remains safe. Doggie should never be allowed to bark, stalk, or growl at the bunny. Once seeing each other has become no big deal for them, you can try a five minute face to face introduction -- with the dog on leash and in a down position. No barking, lunging, or moving around allowed. 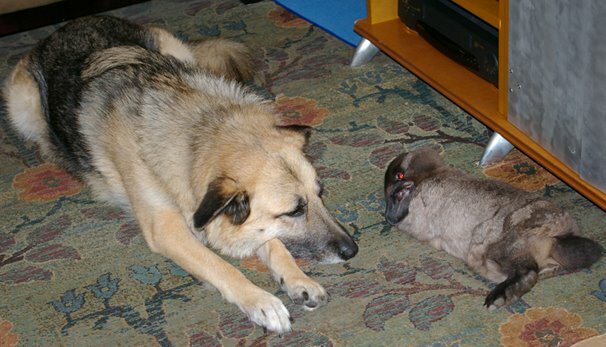 Doggie must know that you are in charge and the bunny is a family member. Give positive kudos to Doggie if she is good. Extend these face to face visits a little bit each time if things are going well. Try giving Star lots of pets and a few raisins each time she sees or visits with Doggie. Make sure to reward Doggie too when she is being a good dog with the bunny. I really, really discourage everyone from making a face to face introduction the first thing that you try with your dog and bunny. This has led to horrible results for lots of rabbits. No good can come from an overly excited dog and a terrified rabbit. Please put yourself in the bunnies place and do an introduction in slow, gradual steps. It's not too late for you to start over and make this a positive experience for the bunny and the dog. I have a 4 year old lop ear rabbit and we just brought home a 9 week old cocker spanile pup. Thumper has always had he run of the house and since Maya has come to live with us, Thumper hides a lot. When Thumper comes got I have Maya lay down and I hold her, and say gentle, nice to the bunny, good girl, over and over again. All Maya wants to do is play, but she's way to rough. Anything more I can do? Do you think I have a chance that they will someday be friends? We just recently lost a 13 year old Cocker that Thumper loved. My wife and I own a 8 month old Netherland Dwarf mix. (not sure what he's mixed with!) Most of the time, he is allowed to roam free of the apartment while we are home. Today, we brought home a (almost) 3 month old Shiba Inu. My wife really wanted this breed, (we live in Japan, currently) and ended up buying one. I wish I had done some research about rabbits and dogs (specifically Shibas) beforehand. I've read that Shibas are not very good with smaller pets. This worries me. We are hoping because our new addition is still a puppy, the transition will be gentle. I guess my question is do you (or anyone else?) have any advice particularly about puppy's and rabbits. A lot of your advice talks about making your dog 'stay' or withhold his excitement. I would think that would be very hard to do with a puppy, since he has not learned those things yet. Of course, over time we will teach him those things, but should we wait to introduce the two until he has a good grasp of being obedient? We have a caged area for him right now (the puppy). So far he has been pretty mild... hardly barks... he's just being a little playful right now. We let the rabbit (Buckwheat) out of his cage to see how he would react to the caged dog. We wanted Buckwheat to feel like he still had control of the house. He hasn't acted as scared as we thought. He has been curious about the caged addition, but keeps his distance. He will not lounge in the living room (where the Shiba is) but instead lyes down in another room. We also have moved Buckwheat's cage from the living room, to our bedroom. The place we bought the dog from said to keep him caged for the first week because he would tire easily with all the space. (I've never heard this before... not sure if this is correct or the Japanese way of doing things). So, since the dog will never be out of his cage for this week, do you think it's safe (in terms of Buckwheat getting too scared) to let Buckwheat roam free? Sorry, this is long. Hopefully not too much information, just wanted to make sure you had the info you needed. Thanks in advance for your advice! My condolences to you on the loss of your 13 year old Cocker. I would think that since Thumper had a good relationship with your previous dog that there is a good chance that he and Maya can be friends too, as long as Maya learns some good boundaries around the bunny. If you can, drop us a note and tell us about your progress. There are lots of people who have questions about bonding a bunny with a puppy, and I just don’t have any experiences to share in that arena! I hope things are going well. Unfortunately, I don’t know a thing about Shiba Inu’s. However, I have heard stories about successful rabbit/dog bonds with unlikely dog breeds. In “The House Rabbit Handbook” by Marinell Harriman she relates a story about bringing a new dog into the household and using the puppy pen as a tool for getting the dog acclimated into the household. I like your idea to let Buckwheat explore around the caged dog. As long as the dog remains relatively calm I think this is okay. Let’s open this topic up. Anyone else with experience bonding puppies and bunnies please chime in. Your experience could be invaluable to others who are trying to walk the same road! Thanks for the advice. And thanks for opening up your blog to our situation. To those who are interested, here's an update. Buckwheat seems to feel completely comfortable now in the living room, where we have Kozi (pronounced with an 'O' sound), the puppy, penned up. Buckwheat doesn't spend a lot of time exploring near Kozi's cage, instead hops a little faster past the cage. He seems just cautious, not afraid. Kozi does a really good job at not getting excited when Buckwheat is near. Infact, he barely acknowledges Buckwheat's existence. After we felt comfortable that Buckwheat wouldn't freak out, we decided to see how the two would do face to face. Since Buckwheat gets to roam pretty much free (for now) I decided to contain the puppy instead vice versa. I took Kozi and held him tight. I let his legs touch the floor, but held onto him so he couldn't take off. I did this about 5 feet away from Buckwheat. Buckwheat slowly hopped his way over, obviously interested, not scared, but very cautious. Kozi still hardly seemed to notice him. I think he was more interested in getting free to explore the living room than meeting the rabbit. Buckwheat finally got close enough for Kozi to touch him nose to nose. At this point, Kozi seemed a little interested and attempted to lick Buckwheat... it was pretty cute, but it was obvious that was out of Buckwheat's comfort zone and he retreated. Not fast and scared... but more like if he knew I was trying to catch him to put him in his cage. Overall, this first meeting worked out really good. We didn't want to push the envelope, so we let that be the end. We are taking Kozi out of his cage more and more. We have Buckwheat stay in the bedroom when we let Kozi out. We keep the time short though, so he doesn't ware himself out. This has been our experience so far. I can't imagine having the bunny free and the puppy free together anytime soon. Kozi is very young, and very playful... I think his playful intentions would just end up scaring Buckwheat... thus backtracking our therapy! If anyone else has more too add, please do! We are playing it by ear on this one, hopefully this shared experience will help someone else, just as Amy's story has! I already had my yorkie puppy for two months now and I didn't know what to do to make them like each other and everything you suggested not to do, I did. I need to know is there hope still for them to get along. Right now my bunny is very fearful of my puppy. She just sits in her litter box all day. I use to leave my puppy out of her kennel until I come from work and I have a something blocking the stairs to my bedroom but my bunny is so scared that she hops right over it and I find her on the stairs everyday (I don't know how long she actually be on the stairs because I work 9-10 hrs a day. So now I just keep precious my puppy in her kennel until I come home. My rabbit is very depressed because she is not eating and she lost a lot of weight. She is not happy. Please Help! I dont know what to do. Hi louida ... I'm one of the owners of the website. I'd say it's time for a break. Keep them apart and out of sight of each other for at least a week. When your rabbit stops seeming fearful, then start over again from scratch. I'm worried that you say your rabbit isn't eating and has lost weight, though. For rabbits, this can be a VERY BAD SIGN ... when under stress or if they have other health problems, their gastrointestinal system can shut down, which can lead to death. Another symptom of GI Stasis is very small droppings. I have a compete opposite problem, my rabbit loves dogs but my dog (a boarder collie) is so scared of the rabbit that any noise the rabbit makes send her into a panic, The rabbit was in the house before we had the dog (our last dog died) and i know that the rabbit hasnt done anything to the dog as the dog wont een be on the same room as her. As i say the slightest noise sends our dog into a panic and then she wets herself. i have tried the intro techniques but to no avail, its been a year now should i give up or is there a way that i can get the dog over this fear? any help from anyone would be greatly valued. My husband and I are looking into getting a black lab puppy at some point. Problem is, my husband hunts and he wants to train the dog to fetch fallen fucks and geese. I do not have a problem with this except for the fact that we have a VERY independent house rabbit that wants everything HER way in the house. Is it even possible to introduce a dog trained to hunt to a rabbit? If anyone has done this, please let me know what you did. Thanks! I have a year old bunny and he has the run of the house. We too are getting a black lab puppy and I'm concerned about bonding. We are getting Bunny neutered next week to help his annoying spraying and territorial marking behaviour and hopefully eliminate any aggressive feelings towards the puppy. Does anyone have any suggestions on how to introduce the two? Hi Katherine. Getting Bunny neutered is a fantastic first step! As you know, male rabbits are much less aggressive when neutered, and much better pets ... no more spraying and marking, no more nipping and circling your feet, and best of all they can be litterbox trained! My advice is to wait a few weeks after the surgery to make sure the hormones are out of Bunny's system, and that he's not in any pain. Then follow the basic steps that Amy and our other posters talk about. Good luck! I just want to tell you how amazing your website has been for us. We recently adopted a cocker spaniel and we have a 5 year old bunny who's never been around dogs. Your blog inspires me and my family to do the same! I used to have a dog who just loved our three bunnies we never really had to go through the bonding process but they would curl up and sleep together or lick eachother's faces. Unfortunately, he passed away recently and we now have a 9 month old golden. I'll be consulting your blog as I try to get him to like and be gentle with our rabbits (who now love all dogs) Thanks for this great resource!